Keep your dogs paws protected when out in the colder elements with the warmth and traction on snow and ice with Polar Trex Dog Boots by RuffWear in Forest Green. When the weather gets tough, tender little paws get rough! 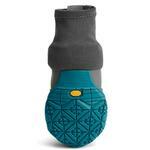 Protect your mountain dog's paws with these insulated, cold-weather boots ideal for ice and snow. The Polar Trex Dog Boots features extended gaiter and innovative (non-touch fastener) closures that keep boots firmly attached in deep snow. 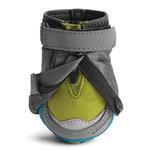 The Cam Buckle ankle strap and cord loop closure system insure a snug fit. We love how weatherproof the insulated boots are and the Vibram ice-specific sole that provides extreme traction on snow and ice. 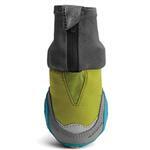 The three-layer laminated soft-shell upper is DWR coated, weather-resistant, wind-resistant, and breathable. The reflective trim offers 360 degrees of visibility. 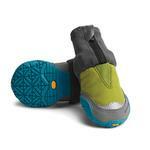 Serious boots for a serious outdoor adventure. Set of 4 dog boots. Paw Width Measures across widest part of paw when bearing weight. Posted On 01/05/18 by N. R. from Fargo, ND Yes, N. R. recommends this product! These are the best dog boots I have found. Definitely buy them in pairs--one pair for the front paws and one pair for the back paws, because front paws are bigger than back paws. I don't have a yard, so the booties go on the dogs three times a day in cold weather. Because they have a sole, the concrete doesn't rip them up. Plus, they are the easiest booties to put on. The downside is they do take some time to break in. Each dog had sores around their dew claws, but that problem seems to be going away. I wrapped elastic bandage wrap around their paws under the dew claw to help minimize their sores. Posted On 10/27/17 by Jane T from Middleborough, MA Yes, Jane T recommends this product! The product is great. However I think I should have ordered the two at a time sets as Pammi my puppy has larger feet in the front than the back so I have to tape the back ones on. Baxter boo has the best products for Dogs. Your sweaters and coats are awesome. My dogs gets complimented wherever we go and I tell them that I get his clothes at Baxter Boo's.